I complain and moan a lot about the lack of choice in Alberta’s shelves when it comes to rum, but truth to tell, we get quite a bit more than other provinces around this country, except maybe BC. Most provinces’ liquor sales in Canada are still under Government control. 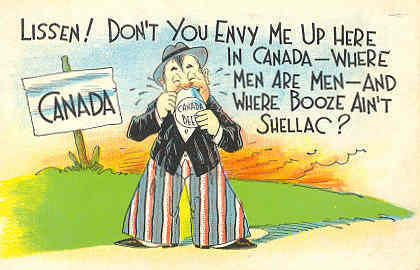 This is the legacy of the well-meaning, though utterly unrealistic, efforts of elected officials to implement Prohibition – yes, Canada had Prohibition – in 1918 and even before. Unlike the US, Canada came to its senses faster (you migh say they sobered up, ha ha), and most of the legislation across the country was repealed within six years. However, in the ’20s and ’30’s very powerful provincial liquor control boards were set up across the country, and liquor sales were, and remain for the most part, tightly regulated. This developed over time into a crazy situation whereby the provincial governments ran most of the liquor shops, and the irony of a body responsible for regulation and enforcement running a for-profit business it is supposed to monitor requires no further elaboration. Alberta, under its powerful premier Ralph Klein, did away with this in 1993, and privatized liquor sales. 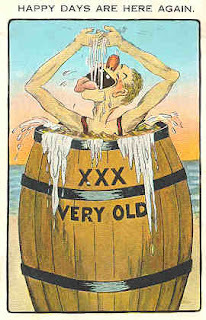 In practice, there is still some Government control: the Federal Excise tax and sales taxes add to prices, the Alberta Gaming and Liquor Commission approves all wholesale imports of liquors (into privately held warehouses) and then collects on subsequent sales to retailers: taxes, bottle fees plus a flat markup (thereby getting revenue from all points of the value chain). But in the main, the objective of introducing competition (however imperfect) to the Alberta market has worked. Before we go there, spare a moment to consider what the act of privatization actually meant in practical terms in 1993. To research this, I spoke to a number of native Calgarians (yes, there are still a few around, but they are on the endangered species list), and they all concur on the basics: there was always and only a limited selection of spirits, and particularly wines; opening hours were limited, and God forbid that any opened on a Sunday; prices were the same province-wide, no matter where one went. There were 208 ALCB stores in the entire province, with another 65 private retailers; and the purchasing process for any kind of bulk (say, for a wedding), was a torturous process requiring the usual forms in multiplicate. Simply stated, it was all limited and a pain, and Hobson’s choice from start to finish. Fast forward 17 years. According to the AGLC (the successor agency to the ALCB), there are now 1220 retail liquor stores in the province (up from the 208+65 noted earlier); another 488 off-sales establishments, like hotels, manufacturers or others, down from 530 hotel-only off sales places before, and 94 general merchandise liquor stores now where none had previously existed. Sales of spirits are up 48%, Beer by 52%, Wines by 109% coolers and ciders by 319%. Revenue to the Government (unspecified but presumed by me to be on direct taxes and levies plus the revenue from the flat markup) climbed from $404.8 million to $716 million. In 1993 there were 2,200 varying products available…there are 16,328 in 2010. I wouldn’t sound the hosannahs and encomiums too loudly, however. The figures sound rosy, but they really aren’t that great from a Government perspective.Consider: the revenue numbers climbed 76.8%, but this disregards inflation; if inflation adjusted numbers are considered, the revenue increase has actually climbed a much more modest 29.9% And this, while the population of Alberta increased from 2,574,890 to 3,786,398…a jump of nearly 50%. So direct revenue per unit of population has actually decreased. On the other hand, all those newly established liquor stores pay taxes (sales and corporate), and this in all likelihood makes up for the difference, if not actually a bit more: and they provide employment (a climb from 1300 to 4000), and so fuelled an additional purchasing pool. The flip side is that wages have decreased as jobs went non-union and capitalism went to work. It sounds a bit like the Red Queen’s Race, doesn’t it? It’s been suggested that increased availability of alcohol in the province would fuel more alcohol related crimes and societal costs, but I came across an examination of this issue (it was done in the late ’90s when a white paper examined the possibility of privatizing Ontario’s system) that implies a rather smaller impact: in the years after privatization, Edmonton experienced a 24% rise in liquor offenses (many having to do with minors possessing alcohol) but a 42% decrease in traffic offenses (you can’t be more surprised than I). And the Calgary police noted that the increase in liquor store related crimes between 1993 and 1995 was offset by the larger number of retail stores opening, so that the risk per store actually decreased, especially when population growth in those years was factored in. As for increased availability leading to increased consumption, some stats imply the reverse, and there are too few studies linking such availability with increased health burdens on the province. That said, a January 2011 article arguing against the matter in New Brunswick stated that based on a recent University of Victoria study, there was a 27.5% increase in alcohol related deaths per 1000 population, for every new liquor store opened in BC. And another study comparing the Ontario LCBO and the prices in BC said flat out that not only were the prices comparable, but private stores had a larger price bump over the last five years than the (cheek-by-jowl) Government operated retail stores. Speaking for Alberta, it seems that the increase in the amount of retail stores roughly parallels the population jump, as do the sales of spirits and beer; I could make a case that the relative affluence of the province has fueled the rise in purchases of wine which greater choice and stocks, as well as better marketing by the stores, have assisted. I am curious how ciders and coolers have gone up by 319%, though, given that no other category went down in compensation, which suggests it’s carved out a niche all its own…maybe among the young who lack the palates for wine or the cash for good spirits. Looking at the above numbers, on balance I’d have to say that the effects have been largely positive: overall, I have not been able to locate any studies or statistics that say categorically that there have been increased societal costs or social burdens in Alberta (I apologize in advance to families or individuals who have been deleteriously affected by the impacts of alcohol, who of course would not share this sentiment) and alcohol-related crime seems to be on par with the levels before privatization on a per capita basis. The amount of problem drinkers as a proportion of the population is about the same. The increased taxes and employment and knock on effects of people with jobs spending money and paying taxes is positive. But statistics can be made to say many things, and at end the debate won’t be solved in this essay. As the New Brunswick discussion makes clear, it’s a societal issue, dominated by high passions on both sides, and it is as much a philosophical matter as social one. I’m not entirely convinced, but it may be a zero sum game when all factors are taken into account. I’ll close with this comment. In the last two years I’ve travelled through The Yukon, NWT, Alberta (hey, I live here), BC, Saskatchewan, Manitoba and Ontario, by road (it’s a relaxation and photo-hobby thing for me). In no other province have I seen the breadth and variety of products as I have in my home turf. Alberta is the cheapest of them all in terms of pricing (Appleton 30 year old costs $300 and rubs shoulders with over seventy other rums in the various stores around here, while in Ontario it costs $550 and rather shamefacedly sits with three other “premium” rums – Zaya 12 was one – and another fifteen bottom tier standards like Lamb’s and Bacardo and Captain Morgan). The Yukon is a bit like Ontario, and the other prairie provinces are in between. And, Alberta boasts liquor stores of nationwide reputation: it’s a running gag on Liquorature that I don’t like whisky, but even I must concede that Willow Park and Kensington Wine Market (Chip, jump in any time with your Edmonton nominations) are famous and maybe the best in Western Canada, stock unbelievably fine products and ranges of whiskies to make a maritimer and an occasional lonesome Scot weep with envy; and the wide selections have permitted myself and two others in this province to begin a labour of love in reviewing spirits. In no other province has this been the case, to this extent. Numbers, dollars, stats and revenue may be debated to the end of time, fierce battles will be fought with teetotallers, religious figures, liberals, conservatives and madmen, and maybe nothing will ever be resolved or proven one way or the other. But in terms of intangibles, I’d have to say that privatization with sufficient regulation is a pretty good thing and works for me in Calgary. Usually, it’s unbridled, unchecked, reckless capitalism and over-intrusive Government intervention that’s the problem. Here in Alberta, we may have found a happy median. 2018 McLean’s article on Ontario’s liquor laws plus 2018 article on Beer in ON corner stores and a short history of ON liquor laws. Liquor privatization can be used by the people for their own benefit. I think this will allow more people to enter this industry which was long dominated by a few people.